The CrossFit Games Open is over, spring is here and summer is around the corner. For many, that means a new training year is upon us. Whether or not you participated in the Open or our in-house Intramural Open, it’s a good time to take a moment and reflect on the past year of training. Now is the chance to think about personal goals in and out of the gym, what worked for you in the past year, and what may not have worked. It’s easy to get caught up in our daily schedules and before we realize it time has passed and we didn’t accomplish what we originally set out to. At No Drama Fitness we set out to help people achieve those goals. 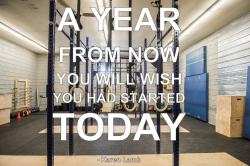 Whether it’s to get better at CrossFit, prepare people for success in other sports or in life, reach body composition goals, or just get a good sweat in because it feels good, we urge people to take time now to think about what those goals are. There are a few things to consider when thinking about you goals. First, think about staircase goal setting. Don’t get too caught up looking too far down the line. Make a goal that gets you to the next step. Reach it and make your next goal, and then your next and keep making progress. Next, use the acronym SMART when thinking about what your goals may be. SMART stands for Specific, Measurable, Attainable, Realistic, and Timely. So when you think about what your goals may be, start broad and then narrow them down so they fit within the SMART parameters. Afterwards, write them down, put them up on our GOALS board, share them in our group. This will help keep you accountable to those goals. It’s a statement to yourself and to our community of supporters that you WILL consistently work towards and achieve that goal. My goal is to have a higher level of balanced fitness. I made it Specific by defining what that means to me in terms of certain milestones with different modes of fitness. I made it Attainable and Realistic by outlining how I was going to train and prepare to reach it and modifying my expectations. I made it Time-bound by considering how long it would take to achieve those goals. Too long and I wouldn’t have the motivation or urgency to consistently work towards it. Too soon and I would be setting myself up for failure. It’s important to me. It keeps me motivated and inspired. Each week I feel closer and closer to it and it lets me know I’m doing the right things and moving in the right direction. I want every person who commits the time and energy to come into the gym and sweats and feels sore the next day to feel as if they are doing the same. So take a moment to think about what’s important to you and what you want to achieve. Create an outline of how you plan on getting there and the different steps you must take to reach that point. What’s Step 1? Write that down. We’ll help ensure that you get there. We have a great group of coaches with a breadth of knowledge and skills to help you. It might be that you plan to come in more frequently, dedicate yourself to approaching WODs differently, or even scheduling a 1:1 session to help breakdown and practice certain movements. Set some goals and then schedule your FREE Goal Setting session below and we will help you develop a plan of attack to reach your goals. Let’s make 2017 the best yet! !